Identification: Upperside is black with iridescent blue bands at the margins. 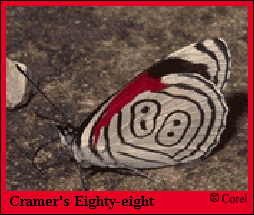 Underside of forewing is red; hindwing is white with a black outlined "88" or "89." Wing Span: 1 1/2 - 1 3/4 inches (3.8 - 4.4 cm). Flight: February-July in Florida, March-November in South America. Caterpillar Hosts: In Brazil, Trema micrantha in the elm family (Ulmaceae). Range: South America. Occasionally strays to South Florida.